Melissa’s journey into yoga began in 2006 at which time she was a police officer living in NY. After sustaining career-ending injuries, Melissa sought relief through yoga and meditation to help with her physical pain, depression, & anxiety. Jessica sent her our way, and Melissa headed up our front desk , keeping things in motion and taking care to welcome our new and regular students. Melissa took more Yoga classes than anyone we knew. We couldn’t keep her for too long behind a desk; We saw where this was going. She earned a 200RYT training in 2016 and fell in love with teaching immediately. Melissa has been teaching Vinyasa, Gentle, & Yin classes ever since. 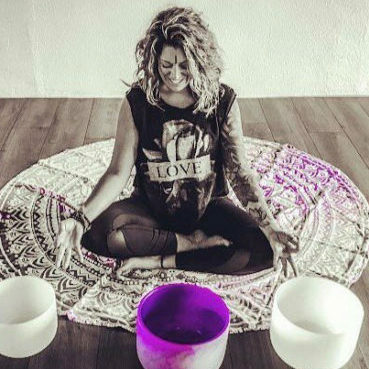 Melissa is also a certified Reiki practitioner and enjoys incorporating sound bowl healing into her yoga students’ savasanas, inviting them to complete their practice with a deepened sense of peace & well being. She is excited to share the techniques that have helped her along her own healing path. Seeking relief from injuries and anxiety. My fellow Yoga & Fitness teachers and friends.